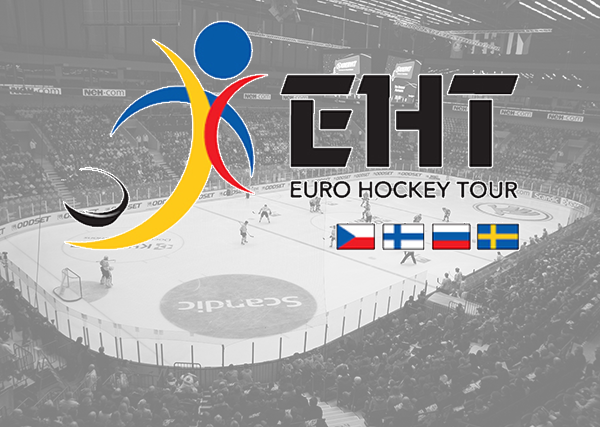 Here you can read about the history of the Euro Hockey Tour and about four tournaments in the Czech Republic, Finland, Russia and Sweden. During the Izvestija cup in 1996, representatives of the four most powerful hockey countries: the Czech Republic, Sweden, Russia and Finland decided to create a new championship, the Euro Hockey Tour. It consisted of four tournaments: the Pragobanka Cup, the Karjala Cup, the Izvestija Cup and the Swedish Hockey Games. The national teams of those four countries participate in all four of the tournaments. Each country can also give a chance to another team to play in the tour, but their results are not counted in the final standings of the Euro Hockey Tour. Each country contributes a quarter of the prize money, which means 25 000 USD. At the end of the Swedish Hockey Games, the unofficial European hockey champion is crowned and receives a prize of 75 000 USD. The second place team receives 25 000 USD. The winner also obtains the Challenge Cup, which was made in Sweden in 1996. The unofficial start of the Euro Hockey Tour is considered the 1996/97 season. That year, the Russians didn`t participate in the Czech Pragobanka cup, so only points from the Karjala cup, the Izvestija cup and the Swedish Hockey Games were counted in the final standings. It was also decided that part of the common contract would be an obligation to produce the television coverage and grant space for commercials during the live broadcast. Finally, there were set dates for all four tournaments. In 1993, it was clear that the fact that there was no international tournament in the Czech Republic put Czech hockey at a disadvantage. Because of that, the Czech national team played few games on home ice and would only take part in the Deutschland cup, the Izvestija cup and the Globen cup. The Czech Hockey Federation, which did not have enough financial or human resources to create a high quality tournament, accepted the offer of Teleaxis Praha and started organizing a tournament with them. The obvious location to host a tournament at the time was in Zlín at the hockey club AC ZPS Zlín (nowadays HC Hamé) and for the next eight years the tour was played in Zlín. First, it was named the Pragobanka cup but in 1998 it got a new sponsor - Česká pojišťovna which gave it its present name, the Česká pojišťovna cup. The first edition of the tournament finished with huge success and perhaps the success of the Czech team increased the excitement of the organisers, sponsors and spectators as the home team played an amazing game during the finals against Sweden. Head coach Luděk Bukač sent 6 forwards on the ice for the final power play of the game and Tomáš Julínek scored from the blue line with 33 seconds left in the third period to tie the game 4:4, which was enough to win the tournament. During the first two years of the tournament, there were four regular participants: the Czech Republic, Russia, Sweden and Slovakia. In 1996, because of the World Cup, the use of the word cup in the name of the tournament was forbidden and even the number of matches before the World Cup was reduced. That year, only the Czech Republic, Sweden and Finland participated. In 1997, the cup became a part of a newly founded Euro Hockey Tour and Slovakia was pushed out by the Finns. In 2003, the tournament took place in Zlín for the last time. The need for a better arena to hold the games in, and the lack of interest shown by the spectators in Zlín forced them to move the tournament. In 2003, the host of the Česká pojišťovna cup was Duhová aréna in Pardubice. The next year, there was no Česká pojišťovna cup because of the World Cup. After the completion of the brand new arena in Liberec, the tournament will move to the Tipsport arana in northern Bohemia. In 1995, the Finns gave it another try. Karjala, one of the most famous Finnish breweries, gave it its name and was also a very strong financial partner. They invited the teams of Sweden, France and the Czech Republic to the tournament. The Czech team had a very poor showing as it did not get any points and lost to France 2:3. That time, the Karjala cup had problems that were unheard of in other tournaments such as the Deutschlad cup. The lack of free dates to play was also a big problem. In 1996, the tournament took place at the same time as the Izvěstija cup before Christmas. That year the Czech Republic sent a better team to Finland, however Moscow played only a backup team. Since 1997, the tournament has ended during the second weekend of November and Team Finland usually has a great performance as a home team; they have won the tournament for the last seven years! The cup with the longest history of all of the Euro Hockey Tour events is without question the Rosno cup. The first edition of the tournament, where the Isvestija Trophy was awarded by the newspaper Izvestija for the first time, was held in 1967 as a celebration of the 50th anniversary of the great October socialist revolution. The tournament also survived the political changes on the border during the eighties and nineties. The cup is an annual event, only in 1991 was it not played because of the political changes. At the time of the new economic environment, the cup had many financial problems. In 1997, it was renamed the Baltika cup as the Baltika brewery became it`s main sponsor. After the prohibition of alcohol advertisement in Russia in 2004, it was held under the sponsorship of a new partner as the Rosno cup. During it`s long history the tournament has gone through many other changes. The number of participants changed several times; initially there were two teams of the Soviet Union competing. The tour system was also changed many times. For example, the 8th edition of the tour in 1974 was played during the whole season - six matches with all the teams together. From 1992 to 1995, the teams were divided into two groups and the winner was selected during the playoffs. Since 1997, the tournament has been a part of the Euro Hockey Tour. The most successful team of the cup`s history is the Soviet Union with a huge lead over the over coutries with 26 total victories including those won by its successor, Russia. The second in historical charts are the teams of Czechoslovakia and the Czech Republic. At the times of the common republic, the Czechoslovaks won four times (in 1970, 1974, 1977 and 1985) and the Czech Republic beat all other teams three times (in 1997, 2001 and 2002). Two titles were won by Sweden (1996 and 1998). Canada scored it`s only victory in 1987 and was the first country that managed, during the communist era, to win a very popular award, the "Wooden snowman". Until 1989, the cup was very prestigious and for Czechoslovaks it used to be the second tournament in terms of importance just below the World championship. The tour was even more important for people of the Soviet Union. After 1989, the prestige of the tournament decreased, as shown in 1995 where Russia showed up with only a backup team because their best players went to Finland to play in the Karjala cup. The Swedish Hockey Games have been played every year since 1991. They usually take place in the spring and are rated as the last real preparation before the World championship. Only in the 2001/02 season was it played in autumn because of the Olympic games in Salt Lake City. The most successful team in the history of the cup is Sweden who managed eight victories out of a total of 15 events. The Czech Republic won only once in 1994. Finland has had three victories since they first participated in the tournament in 1991. They have since missed five events. They have been playing regularly in the tournament since 1997. The Cup was also won by Russians, another triumph in the name of the Soviet Union. In 1992, Canada was the victorious team. However, they have not taken part in in the tournament for the last two years.